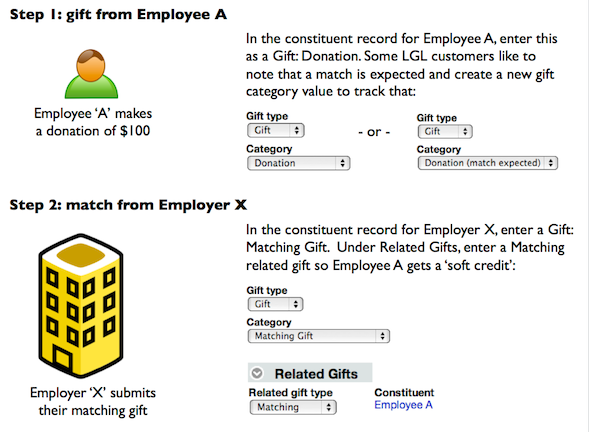 LGL is often asked about how to properly enter and track matching gifts from organizations and associated gifts from individual donors who work at those organizations. (Both for-profit and nonprofit employers have HR policies providing matching dollars for employee contributions and/or volunteer time.) This article is intended to help explain the scenarios we've seen for matching gifts and guide (but not dictate) your gift entry/stewardship procedures. Q: What is a "matching gift?" Matching gifts are not equivalent to sponsorship. Corporate sponsorship dollars bring a very different host of questions and legal/tax issues to the table. While a company may choose to support your organization through a separate channel, the matching gift program is not about the company's interest in your organizational mission. Q: Should you enter a pledge from the employer when your donor, their employee, sends their money? No. The exception to this would be if you receive a written letter from the employer committing to a specific amount at a specific time based on the qualifying gift their employee, your donor, has made. An organization's commitment to their matching gift program does not mean they are pledging money to your organization. It is an employee benefit program the company can choose to change or cancel at any time. There may be elements to the employee benefit policy that mean your organization cannot receive matching gifts even though your donor tells you they will arrive (whether or not your nonprofit qualifies according to their guidelines, etc.). These programs are not in the employee's control. Q: Should you enter a pledge for the combination of the employee's promise plus the anticipated match? No. The employee cannot obligate their employer to pay, therefore they can't say the company's match is a pledge. The best practice is to only enter pledges into LGL when you have a specific promise from a person or organization that a) specifies a dollar amount and b) specifies a time in the future when the total dollar amount will be given. Some organizations manage different categories of pledges (verbal vs. written), but when they do so they commit to careful data maintenance around those categories. In this scenario your donor, John Smith, works at XYZ Company. XYZ Company has an employee gift matching policy that requires their employee to provide proof of cash giving to a qualifying nonprofit organization; they match 100% of the employee's giving up to $1,000 per year. Send John an acknowledgment letter. Include language thanking him for telling you his gift will be matched and asking him to contact you if there is something you need to ensure the matching gift arrives. Company match. On February 1, 2016, a gift for $1,000 arrives from XYZ Company with a letter saying the check represents the company match of employee's gift made in December 2015. The key difference from Scenario 1 is that, like the corporate foundation, the matching dollars are likely a grant and there is no need to include any tax-deduction language in your thank you letter. Other aspects are the same as Scenario 1. Enter the amount the donor withheld from their paycheck that is included in this check from the employer as a gift in the donor's record. We believe this to be the right course of action because the employer has held the money temporarily and is passing it along to your organization, but they have not taken ownership of the gift like a corporate foundation or nonprofit employer might. Thank the donor and include gift receipt language. Enter the amount of money from the employer and add related, matching gift(s) for the donor(s) as needed. This is most similar to Scenarios 2 and 3. The fact that all the money arrives in a single check does not change the ownership of the funds. Matching gifts can become complicated depending on the employer's setup. The above reflects LGL's understanding of how most situations work, but we recommend always working with your donor to get in touch with the employer (or fully read and understand their matching gift literature) to understand how best to work with each employer's matching gift program.